The source code is available on github. Feel free to contribute or just have a poke around. Removed sword blocking. Added left hand delay for attack similar to right hand. Implemented attributes. The heraldry update is planned for later. We can proudly announce the (probably) final version of Mine & Blade Battlegear 2 for 1.6.4. It is stable enough and introduces the long awaited quiver system, hence its codename. The next big update (heraldry) will likely be included with 1.7.4 (or later Minecraft update). We have (finally) released the first version of Mine & Blade Battlegear 2 for 1.6.2. This release has been codenamed "Warcry". This gives a good indication that this version focuses on Warrior's but also is likened to GotoLink and myself charging in with our first release. Shields block all incoming damage from the front 120 degree arc when in use. Beware they can only be in use for a limited amount of time. Mine and Blade 2 introduces a new weapon system to Minecraft. This system will allow the player to have up to 3 weapons sets available to them that can be switched to using the 'R' key. The system allows the player to specify a mainhand and an offhand weapon (so allows select dual wielding). Mine and Blade 2 introduces a shielding mechanic different to the normal sword block. Blocking with a shield will reduce all blockable damage taken from the front 120 degree arc. However a player cannot block indefinably as there is a stamina bar that appears above the normal minecraft health/armour icons. A shield bash can be preformed by pressing the special action key ('Z' by default). This will cause any mob in front of you to be knocked back. Using a shield bash will cause you to loose a third of your stamina bar and render you unable to attack for 1/2 a second. Some enchantments can help improve those characteristics. Although the waraxe does less damage to unarmoured foes than the sword, it is more able to penatrate armoured foes. The quiver is a small item that has the ability to stack four times more arrows than a common arrow stack. It can be crafted with leather and arrows. You can empty it by right click. Quivers can also be dyed similar to leather armour. 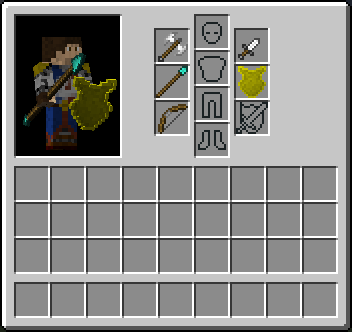 Dye is removed by placing a water bucket in the crafting grid with the quiver. Once you have a charged quiver in your inventory, a bow will deplete this item rather than using free arrows. A bow can be "dualwield" with the quiver in offhand. 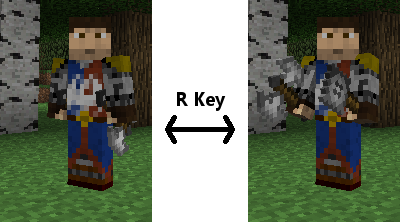 With a bow equipped, a custom bar will appear showing slots from the quiver. You can switch between slots (and thus, between arrows) with the special action key ('Z' by default). The quiver will also appear in the player's back. There is an API that allows modders to make their own container for their own custom arrows, with hooks to customize enchantments, bow damage, etc. Mine & Blade Battlegear 2 adds seven types of arrow which can be fired only from the quiver. The bow is also rendered differently to show those different arrows when used. The fire arrows...set things on fire. The ender arrows...teleport things around. The poison arrow...gives a wither effect on hit. The piercing arrow pierces through armors and glass blocks. The mystery arrow...has weird effects. The leech arrow takes your enemy lifeforce to heal you. It is said that skeletons may have acquired the knowledge to use those arrows. Fortunately, they aren't clever enough to hide them in their quiver nor switch between them. Mine & Blade Battlegear 2 contains a sophisticated new mod update detector known as M.U.D. The mod will check to see if you are running the most current version (for the version of minecraft you are using) and notify you if you are using an old version. Pressing the Mod Update Detector button on the pause screen or in forges "Mods" screen or typing the command '/mud' will take you to the download screen. This will allow you to view the changelog and download then newest version of the mod (a restart will be required). This part is strictly client-side, meaning you can deactivate it on your client without worrying about server conflict. It also means that, because it is disabled on server, a server owner has to update manually. It is designed this way to prevent any server overload. We are looking into a new way of implementing this. I love this mod, i dont know if your team still look at the 1.7.10 mod, but i play this mod with MineFantasy II, the problem is, i cant wield the two handed weapon in the M&B battlegear inventory, if you can change this will be very nice, as MineFantasy is on working for 1.12.
how do you attack with both weapons in hand? im on 1.7.10 BTW. please update it to 1.10.2,1.11.2,1.12 please! im using the 1.7 version and i cant use the left item at all it doesnt work why is that? May i use this in for my first modpack its called redcraft. HEY I HAVE OP SWORD!!! ITS ONE HIT CHEESE! How do I turn off the shield timer. what language is that and what does it mean? Seems like Spanish to me, but i'm not 100% certain.